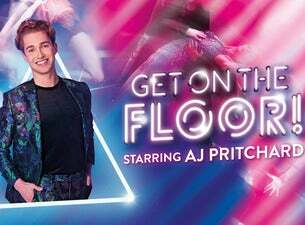 Get ready for a dance show like no other, starring Strictly star/ TV personality AJ Pritchard. A fabulous fusion of styles combine with an iconic musical playlist and a dynamic cast of dance and vocal talent to set your pulse racing. Worldwide dancefloor flavours include tango, ballroom, latin, hip-hop, contemporary and commercial with stunning live vocals, striking costumes, and an exciting remixed sound. Get on the Floor! is a high voltage celebration of dance that will leave you on the edge of your seat to the music of pop’s biggest party anthems. Feel the pulse – feel the rhythm and watch our sensational cast GET ON THE FLOOR!